Because that's not creepy, right? Medical advancements have no doubt made incredible leaps and bounds thanks to medicine's hand in hand relationship with technology. Case in point, Johnson & Johnson, makers of numerous healthcare, pharmaceutical, and beauty products, have announced a collaboration with Google to create robots that will assist with minor surgical procedures. According to a press release issued yesterday, Johnson & Johnson aims to "put the best science, technology and surgical know-how in the hands of medical teams around the world," by partnering with Google in this endeavor. "Robotic-assisted surgery is a type of minimally invasive surgery that uses technology to give surgeons greater control, access and accuracy during the surgical procedure while benefitting patients by minimizing trauma and scarring [and] enabling accelerated post-surgical healing." The Life Sciences team at Google hopes to utilize sensor and imaging technology to benefit surgeons by offering up important data analytics and detailed images during surgical procedures. According to The Next Web, Google's technology would ideally "highlight blood vessels, nerves or tumor margins, [and show] relevant surgical information at the right time. Information will also be displayed in an overlay interface during operations so surgeons do not have to view multiple screens to access relevant data." This seems like a logical pairing and a good way to take another step forward where medical advancements are concerned, but the cyberpunk in me is admittedly a little nervous. Could this be one step closer to the replacement of surgeons with robots altogether? 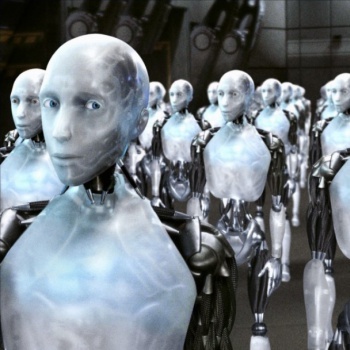 Oh well, we've probably got at least a few more years before any sort of real robotic takeover happens, right?